Winter sleeping bags, also known as four season sleeping bags, provide additional insulation for camping in the cooler months. Not all sleeping bags are the same, even if they look similar. Sleeping bags are rated by temperature and typically show what’s a comfortable temperature. To make things easier, these temperature ranges usually fall into ‘seasons’. A one season bag is intended for Summer; a four season is intended for Winter. You may however, see many different temperatures mentioned on the sleeping bag, which can be a little confusing. Selecting the wrong one in Winter could even be life threatening. The table below describes what these temperature ratings mean. This is actually a standard called EN_13537, and it defines the ranges of temperature that a sleeping bag can be used in. Upper Limit This is supposed to be the temperature that a ‘standard man’ would be comfortable without sweating, with arms outside the bag and the bag unzipped. I say ‘supposed’ as all of us are slightly different – a ‘standard man’ is supposed to be a 25-year-old weighing 73kg and is 1.73m high….that’s not me 😉 In other words, if it is any warmer than this temperature then the bag will be too hot. Comfort This is the temperature a ‘standard woman’ (again, this might not be you) can expect to sleep comfortably. Lower Limit The temperature that a ‘standard man’ (so perhaps a slightly lower limit than a ‘standard woman’) can sleep for 8 hours in a curled position without waking. Extreme The minimum temperature to use the sleeping bag by a ‘standard woman’ for six hours without dying from hypothermia….though some frostbite is still possible (oh, great!). This is the emergency-last-resort-temperature. So you should be buying a bag for night time temperatures between the Comfort and Lower Limit range, though we’ve found that you want to be getting a bag closer to the Comfort range. When choosing a sleeping bag for the cooler months it’s obviously very important to select the correct comfort range. You will find some sleeping bags that have a very low Extreme temperature rating compared to the Lower Limit; others not so. However, do not choose a bag that is too warm either as you don’t want to be sweating in the bag. To make choosing a sleeping bag easier, they are often labelled by season. These aren’t always the same between different sleeping bag manufacturers, but the table below shows the typical temperatures. Note: only use the seasons as a guide to selecting a sleeping bag. Always check the temperature ratings is right for you before buying. 1 Season Best for Summer only and may be rated for the coldest temperatures of about +4 to +5 degrees. Some kids sleeping bags are Summer only, so if going family camping in Spring and Autumn, please check your bags. If you’re summer camping in Europe then a 1 Season bag is ideal…and in fact, you may not even sleep in it. A warmer bag would be too much in those conditions. 2 Season Consider this if you are extending your camping season from Late Spring through to Early Autumn. For most UK family campers a 2 Season bag is adequate (along with some other measures to keeping warm in the cooler months). However, you would not want the temperature to go below zero. 3 Season If Spring and Autumn camping is what you are doing, then go for a 3 Season bag. Most of these will keep you warm on cold nights but also be not too hot on mild nights (though you might need to have it unzipped). Their lower limit may be rated from zero to -5 degrees, but these aren’t rated for Winter conditions – i.e. don’t use a 3 Season bag if you are expecting frost or snow. 4 Season Winter bags that are suitable for very cold Winter nights down to -10 degrees. As you can see, Winter sleeping bags are typically down to -10 degrees (lower limit). This is typically OK for most UK Winters, though we have seen temperatures hold steady at -18 in some places. You can of course, get sleeping bags for extreme conditions, but you typically won’t be taking the kids on such expeditions. Also, note the altitude of where you are camping. As a rule of thumb, every 150m higher could see a drop by 1 degree. Never solely rely on the rating of your sleeping bag, though. Always take other measures to keep warm when winter camping. Out of the different styles of sleeping bags, it is best to get a mummy-shaped sleeping bag. These have a built-in hood that can be drawn around your face, just leaving your nose, mouth and eyes exposed, retaining more of your body heat within the bag. Remember to never sleep breathing into the bag as this can cause condensation to build up in the bag, making it wet and actually increasing the risk of hypothermia. A useful addition to the sleeping bag’s design is a foot box section to help keep your feet warm. So don’t just go on each bag’s reported rating, take into account all the other features for the price you can afford. You should also find ‘baffles’. This is where the sleeping bag is made with different panels, each filled with the insulating material (see below on Down vs. Synthetic). These baffles prevent the insulation from moving around in the bag. Without them, insulation could move away from some areas creating cold spots. Winter sleeping bags should also have a ‘baffle’ or part of the bag around the zip. Without insulation around the zip, it will act as a cold spot, letting out your valuable body heat. Natural ‘down’ sleeping bags are filled with fine feathers, which may be from either geese or ducks. Down bags with goose feathers are slightly more expensive but insulate more. Down is the small fluffy feathers found on chicks. Down is used in bags as the feathers trap small pockets of air (and therefore your body heat). Even when the down is compressed (such as when you lay on it), down still traps small air pockets and insulates. It performs extremely well for its weight and compresses well. 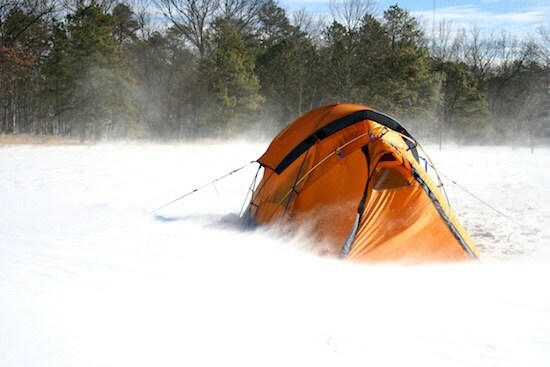 When choosing a down-filled sleeping bag you may come across the Fill Power. This is the insulating value of the down. The higher the Fill Power the less down is needed to provide decent insulation, making the sleeping bag smaller and more packable. It doesn’t perform well when wet, and you must keep down dry. It also isn’t as breathable compared to synthetic materials. Man-made synthetic fillings simulate natural down. Different synthetics perform better than others, with some being heavier and bulkier than down (though technology is improving all the time), but all perform better than down if wet, and are breathable too.